Do you have different criteria for all the different projects students do? It’s a good question. I know teachers sometimes hesitate to open up assignment or project formats because of the dilemma it poses when it comes to grading or marking the work. How can one be fair and equitable? I wouldn’t recommend having a different criteria for different formats for exactly those reasons. First of all, it would be time consuming and teachers need to use their time wisely. Secondly, teachers might be perceived to be acting unfairly. What can be done? 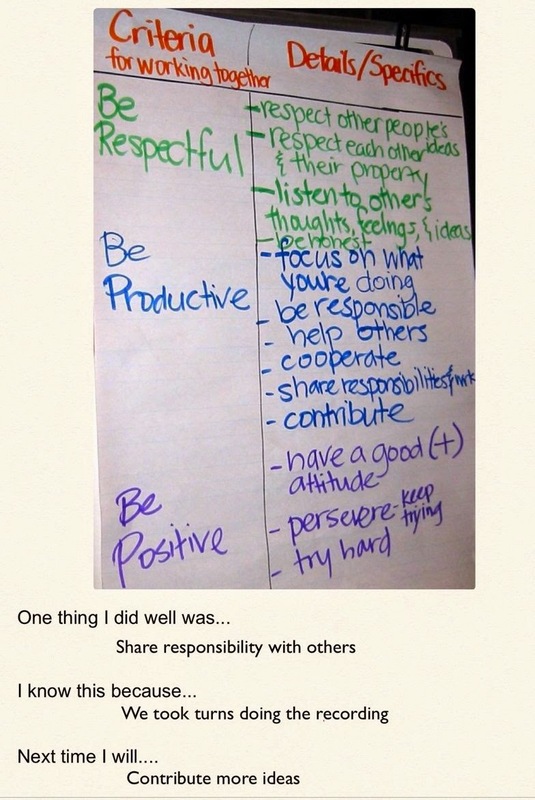 Here are two practical ways teachers manage co-constructing criteria in this kind of situation. A high school teacher had multiple blocks of English. Early in the semester he asked students, “What’s important about quality? And then, as they worked on different assignments he would remind them of their criteria for quality and they would add whatever was needed for the individual assignment. The criteria became, ‘Quality plus…. ‘Here are two pictures of the criteria students and teacher co-created for quality. I love the second one. Notice the title has been crossed out and renamed as, "Use to Check it TWICE"
Another teacher wanted students to represent their learning for their research project in a variety of ways. They had previously co-constructed criteria about research methods. They had done projects together – all doing the same kind of project. But this time, towards the end of the year, the teacher wanted them to represent their learning in a variety of ways. 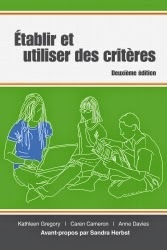 This example is from Setting and Using Criteria by Gregory et al (2011, p. 30-32) available in English or in French. What counts in a research project? Each criteria had the collection of student ideas alongside it in a T chart so the students would remember the important elements or details. When the projects were handed in the same criteria were used to assess and evaluate each project. Students, prior to submitting their project were asked to do a detailed self-assessment explaining how they had met each criteria showing where the teacher would find evidence of them doing so. When the teacher reviewed the projects what the students had said was considered and then added the teacher added more specific feedback. The criteria encouraged all students to explore different ways of showing what they were learning and reach towards quality no matter what representational form they chose. The criteria also made it possible for the teacher to support all learners to move towards quality no matter what representational form they chose. Equal is not always fair. The co-constructed criteria gave the teacher the means to be fair and equitable while honouring quality work no matter what form it took. As you begin this new year thinking about how to support every learner to show you proof of learning consider ways to 'open up' the evidence collection so more students can represent their learning in ways that make sense for their kinds of minds. Evaluation and reporting – assessment oflearning – requires that teachers’ professional judgment is informed and clearly communicated. Developing our informed professional judgment is a key professional undertaking. And, taking a fresh look at our grading and reporting practices prior to beginning a new school year can set us AND our students up for success. As teachers learn more about summative assessment, it is important to engage in processes to deliberately inform professional judgment since professional judgment is a key aspect of summative assessment. Teachers are working thoughtfully to make sense of grading and reporting structures in order to better reflect what students know, do, and say in light of changing learning priorities. They are rethinking assessment of learning to better communicate their informed professional judgment about what students have learned. There was a powerful research study done by the Assessment Reform Group called The Role of Teachers in the Assessment of Learning (2007). You can download a copy here. It found that teachers’ professional judgment is more reliable and valid when teachers engage in looking at student work, co-construct criteria about quality, score the work, and check for inter-rater reliability. This is the kind of work that can help teachers improve their professional judgment regarding the learning and achievement that has occurred. Agree to work with colleagues over time to come to agreement about quality. Collect student work samples related to key aspects of learning (could be product or application). Examine those samples in terms of expected quality levels. Work together to co-construct criteria for quality. This may be in the form of a development continuum or progression. 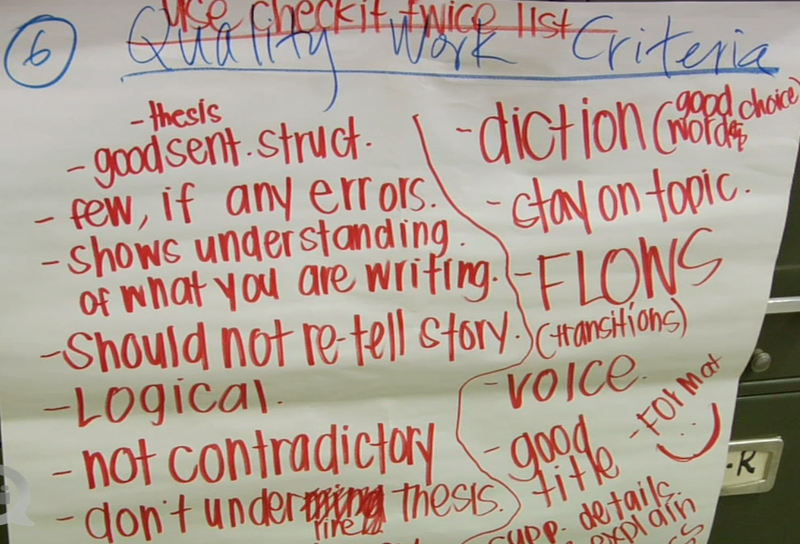 Practice using the criteria to look at student work and giving specific, descriptive feedback. This process informs professional judgment. It is very powerful professional learning. Professional judgment is a key part of the evaluation process. 1. Read more about the process of coming to understand quality and informing our professional judgment in Chapter 4 of Making Classroom Assessment Work. Or, read more about this important topic in Chapter 3 of A Fresh Look at Grading and Reporting in High Schools. 2. Read Chapter 10 of Making Classroom Assessment Work. Notice the different ways teachers work within their current rules and regulations regarding reporting and yet still exert their professional judgment regarding student learning and achievement. Do the end-of-chapter tasks on page 104. 3. View a Secondary Q&A with a group of high school teachers regarding giving percentage grades and letter grades. 4. Revisit an earlier blog about moving From Reporting to Informing. There is a link to a great video that might be useful as you plan for the new year. Read Chapter 12 in Transforming Schools and Systems Using Assessment. It is titled Standards-based Grading and Reporting. Read our blog about Zeros, No Zeros and the Dangers of Dichotomies. Join an online learning opportunity about this topic. We suggest this one focused on using samples in support of learning. As we close this series and approach the new school year, we wish the best for all those who work so hard on behalf of children and their future. In particular, our thoughts are with our colleagues in British Columbia. PS If you need any assistance, please call our office and speak with our helpful staff. 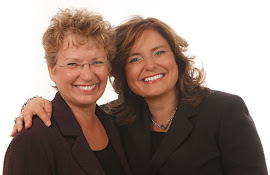 They will connect you to the resources and support that will best suit your learning needs. 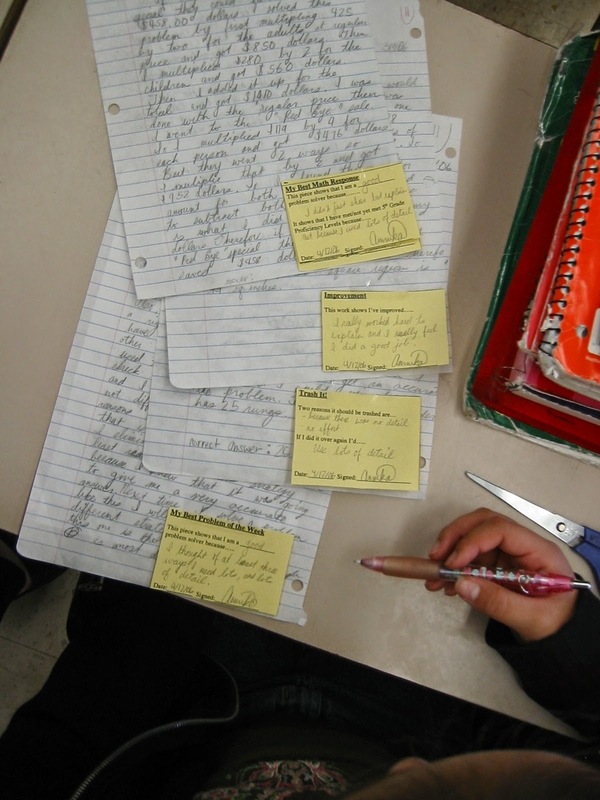 After involving students in assessment it just makes sense to extend the process and have students collecting and communicating evidence of learning to others. When students communicate with others about their learning, they come to understand what they have learned, what they need to learn, and what kind of support may be available to them. They receive feedback and recognition from themselves and from others that guide and support their learning. The process of preparing and presenting gives students an opportunity to construct their understanding and to help others make meaning of their learning. Active involvement by students means teachers' roles change from doingthe communicating to guiding the process and organizing students, who then show or demonstrate their own learning. Once students have collected evidence of their learning, a next step is showing their evidence to others since the presence of others influences what and how we present. Students show the evidence to teachers. 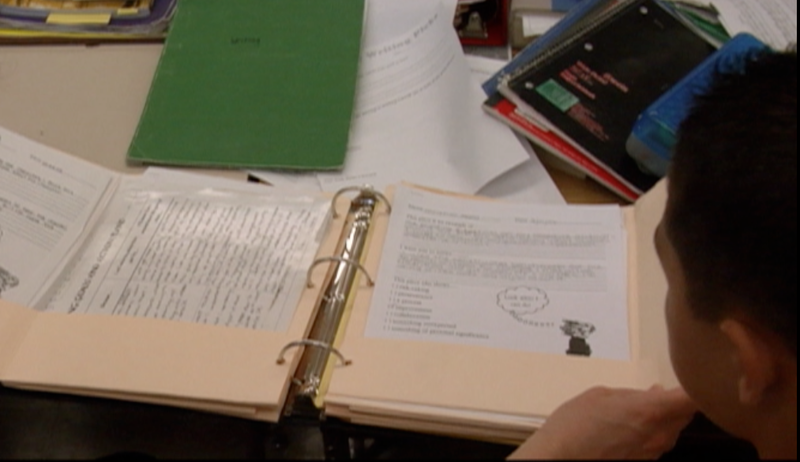 This process of communicating evidence of their learning assists learners to step back and reflect – to assess what they are doing and reexamine their current practices. Some of the ways learners present evidence of learning include sharing student work samples, professional portfolios, or postings online. When parents and others watch demonstrations of learning or attend student-parent conferences, it can help inform them about progress as well as serve to increase their appreciation of their son or daughter as a learner, his or her level of skill development, the breadth of the classroom and school curriculum, and the efforts needed on everyone’s behalf to make learning possible.In Conferencing and Reporting there are ten ways to involve students in communicating evidence of learning to others including parents and guardians as well as detailed information and reproducibles for student-parent-teacher conferences, IEP conferences and student-teacher conferences. This book will soon be available in French. No matter what the format, it is important that learners identify what has been learned and what the evidence shows, then ask for specific feedback that can help them frame their own next learning steps. Read Chapter 8 of Making Classroom Assessment Work. Pay attention to the process of communicating evidence of student learning during the term and do the end-of-chapter assignment. Read Chapter 1 of Conferencing and Reporting with your colleagues. Adapt the ideas to use with your learners. Consider downloading free reproducibles here. View this video selection of a fifth grade class making work sample selections to show their parents during their at-home student-parent conference. Read Chapter 8 in Leading the Way to Assessment for Learning: A Practical Guide. Pay particular attention to the section at the end titled, “Being a Leader.” There are ideas for supporting teachers and for ‘walking the talk’ yourself. Sign up to share a Professional Learning video with the colleagues you support on the topic of involving students, parents and teachers in Student-Involved Conferences. If you need any assistance, please call our office and speak with our helpful staff. They will connect you to the resources and support that will best suit your learning needs. We hope you are enjoying these last days of August. The Leaders' Institute in Fredericton, NB, has been fabulous. We can’t wait to begin working with our colleagues in a variety of different locations over these last couple of weeks before school begins. PS If you have questions or need help, just call 1.800.603.9888 or 250.703.2920. Involving students in the classroom assessment process is incredibly important in terms of engagement, building relationships, motivation, and ownership. It also supports learners as they move from co-regulation to self-regulation. It also teaches important executive functioning skills. All this while it provides opportunities for students to link to prior knowledge, analyze, synthesize, critical thinking, creativity and collaboration. Co-construct criteria to deepen their understanding of quality and improvement over time. Engage in self- and peer assessment in relation to criteria. Collect evidence of their own learning. Self-assessment is possible because, when students co-construct criteria with teachers' guidance, we give them the understandings of quality and the language they need to use as they self-assess. They begin to gain the experiences and the skills needed to self-monitor their way to success. These are teachable strategies based on sound principles backed up by a breadth of research. Co-construct criteria around behaviours and key products. 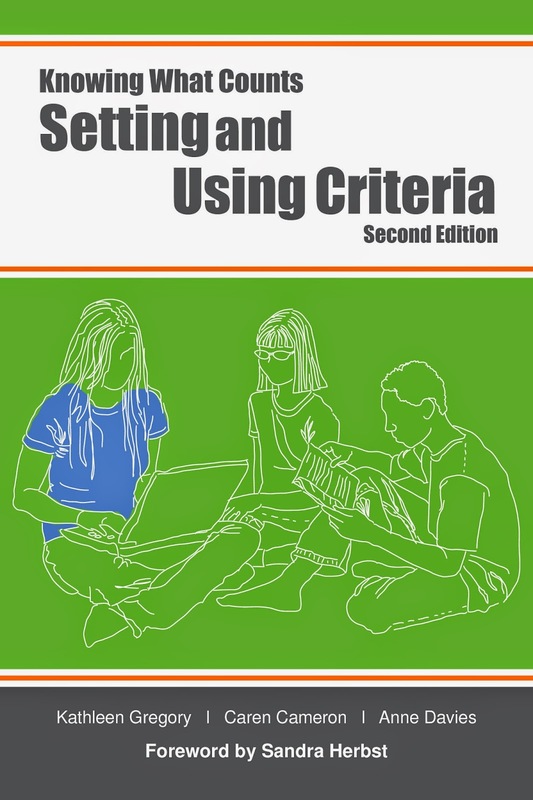 Have students use the language of the criteria to self-assess and peer assess. Use the criteria as a goal setting strategy. In this example older learners co-constructed criteria around working together. Then the criteria was used as a self-assessment and to set a 'next steps' goal. When working with very young learners, the teacher supported the students to co-construct criteria around reading new texts. 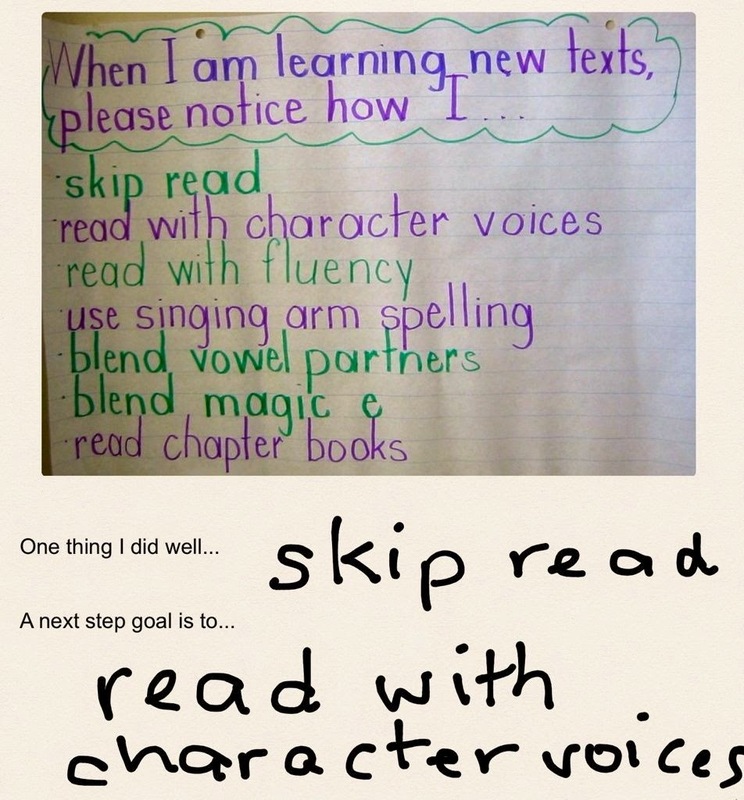 Then the criteria was used as a self-assessment and a 'next steps' goal. 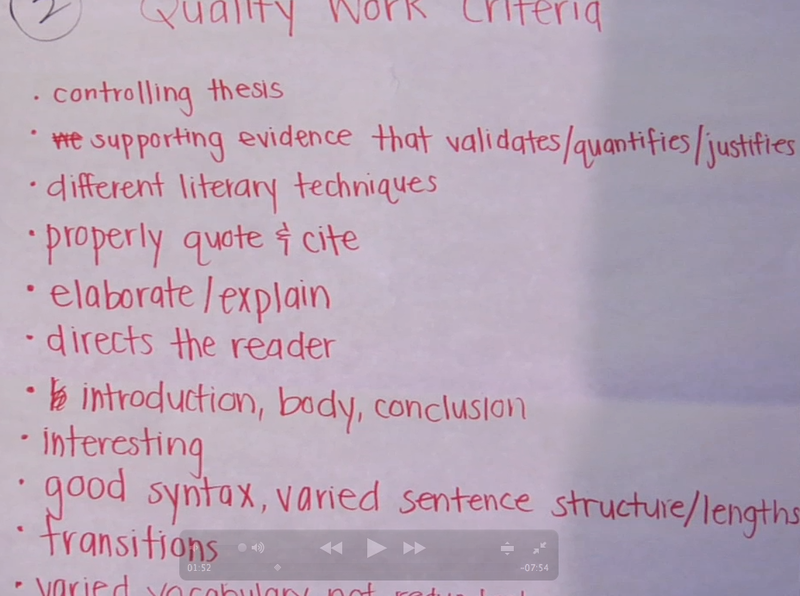 You might also want to ask students to use the language of the criteria in their journals and reflections. It can increase their metacognitive thinking. Teachers need to deliberately teach students how to self-assess in relation to the criteria so they learn to use the language of the criteria – the language of assessment and of learning – and become more specific. This helps them give themselves and others specific, descriptive feedback. This is an example of co-regulation leading to self-regulation. And it can save teachers huge amounts of time later as it prepares students to self-monitor their own learning and collect their own evidence of learning. 1. Think about how you already involve students in assessment in the service of their own learning. What do you want to ‘tweak’ for the upcoming year? Make a plan. 2. Watch this video about co-constructing criteria. 3. Read Chapter 6 and 7 in Making Classroom Assessment Work. Pay attention to the ways students are involved in the assessment practice and consider how much they experience and learn in relation to curriculum goals and core competencies. Complete the tasks at the end of Chapter 6 and Chapter 7. 1. View this video so you can learn more about the process of co-constructing criteria as well as respond when people question the value of involving students in the assessment process. 2. Join an online learning opportunity about this topic so you can support your colleagues' learning. We suggest co-constructing criteria, meaningful goal setting, and improving the quality of the feedback students receive. We will post the #4 in the next few days. We are looking forward to being in Edmonton, AB, very soon.